Acroyogis Micki Mooney and Jeremy Martin perform an impromptu High Sidestar pose at the early morning dance party in Center City. The next Daybreaker, the early-morning dance party, will take place Wednesday, March 6, at the Free Library of Philadelphia's Parkway Central branch. Since the event takes place during Women's History Month, and a few days before International Women's Day, the theme will be "The Future is Feminine." Each Daybreaker has a different theme and attendees are encouraged to dress in costumes that relate to it. 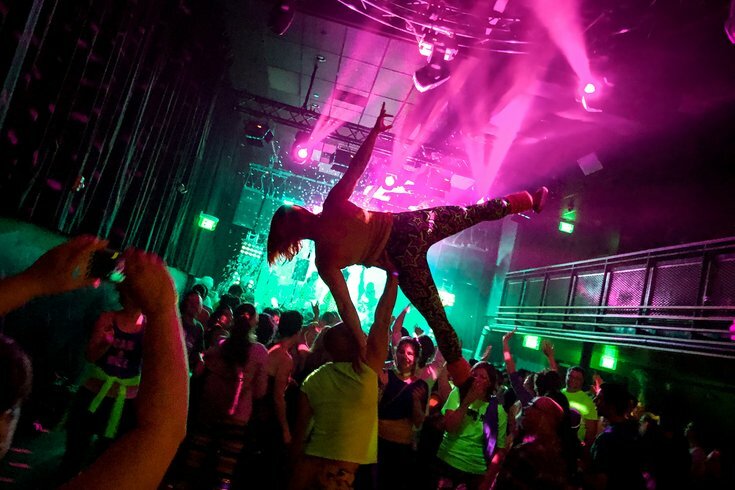 The event starts with yoga at 6 a.m., then there's a sober rave beginning at 7. Attendees will dance for two hours to a live DJ – getting a full (and fun!) workout in before heading to work. There will be free kombucha and healthy breakfast bites, too. Tickets to participate in both yoga and dance are $35. Early bird tickets for just the dance portion are currently available for $15.